In the Presence of a Master: Discovering Leonardo da Vinci's "Horse and Rider"
When people think of the great figures in history, and specifically the art world, Leonardo da Vinci is an easy name recall – even among laypeople. Like all historical figures, however, Da Vinci is necessarily from another time, and yet he still manages to surprise the contemporary world with his extraordinary art. The mold for the one-of-a-kind “Horse and Rider” was recently discovered in the possession of American businessman Richard A. Lewis, and with the help of a team of professionals, including art broker Rod Maly and art appraiser Brett Maly, the owner shared this amazing find with the world at the beautiful Greystone Mansion in Beverly Hills, Calif.
Circa 1508, Leonardo da Vinci sculpted a figure in military attire on a horse from a solid block of beeswax. The figure was French governor of Milan Charles d’Amboise. It was presumed that the sculpture was to be a model of a larger monument that was never constructed. 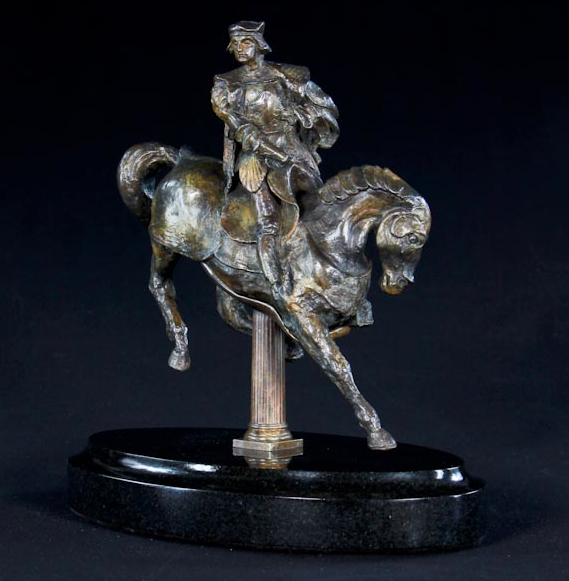 In 1985, the sculpture was authenticated by Dr. Carlo Pedretti – the foremost authority on the life and works of Leonardo da Vinci – who dubbed the sculpture “Horse and Rider”. A mold was made to preserve the work. Two years later, Richard A. Lewis bought the mold and supporting documents in New York, and brought the mold home where it remained hidden in obscurity for 25 years. Finally, two years ago, Lewis reached out to the Maly’s of Art Encounter in Las Vegas, NV to help him share this magnificent piece of art with the world. To that end, 996 castings in four different patinas have been from the mold, and they are available for purchase. Art of this gravitas deserves to be surrounded by beauty, and Greystone Mansion was the perfect venue, with its multi-tiered grounds cutting through the lush landscape. In the courtyard, just beyond the pitter-patter of the fountain, four castings of “Horse and Rider” in different patinas stood guard on individual pedestals. Behind them was the alcove that housed the delicate mold that had been hidden away for so long. Rod went on to explain the finer points of the art itself, revealing that beeswax is an unforgiving medium when compared to material like clay that allows artists to correct mistakes easily. And yet, Da Vinci was still able to carve a detailed and remarkable likeness of Charles d’Amboise within the space of a fingernail. According to equestrian experts, even the command of the horse is excellent. Pricing for the castings was done by gut. “This has never been done in the history of mankind before. You can’t go to the book…. You can’t Google it,” Rod says. For interested art collectors, three of the patinas will have 299 castings made which will each be sold for $25,000. The silver patina will only have 99 castings made and will sell for $35,000 each. Mr. Lewis has agreed to donate one million dollars of the proceedings to the Salvation Army. The exhibit at Greystone Mansion was only the first stop on a planned world tour for the piece, which includes London and New York. Those who missed the Beverly Hills reveal can enjoy the art at the Venetian hotel in Las Vegas, NV until October 15 as part of an art exhibit titled “Da Vinci the Genius”. Discover more about “Horse and Rider” at www.davincihorseandrider.com.